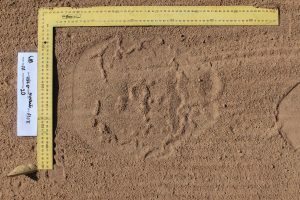 We’re often asked, ‘Which is the most challenging species to ID from footprints?’. Surprisingly it’s not the tiny dormouse, who, although she has footpads less than 1mm in diameter, has plenty of complexity in the footprint. It’s the elephant, whose huge footprints can be more than 30cm long. Although their feet are huge, the toes are invisible and only sometimes are toenail impressions visible, leaving a fairly amorphous ‘blob’ in the sand. 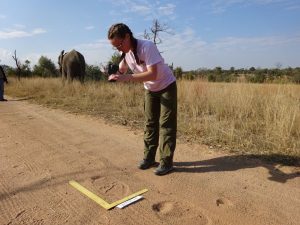 Luckily we have Katrina Leser, a North Carolina State University student, helping us collect elephant footprints out in South Africa. 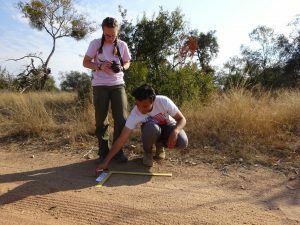 Katrina is currently based at the Rory Hensman Conservation and Research Unit (RHCRU), and seen here working with students Clarissa McCall and William Vose from the USA to collect elephant footprints for WildTrack’s ConservationFIT project. love reading your posts from the field about the fascinating and meaningful work ConservationFIT is doing.